recommended for: Fans of Diana Wynne Jones (especially Howl's Moving Castle), anything by Scott Westerfeld (like Pretties, Leviathan), The Hunger Games, or Divergent. Bobby Pendragon is a seemingly normal fourteen-year-old boy. He has a family, a home, and even Marley, his beloved dog. But there is something very special about Bobby. He is going to save the world. The Pendragon series is an old and beloved favorite of mine. It has everything you could want from the fantasy and sci-fi camps, mushed together with some flavors of dystopian, romance, and adventure. Very basically, it's a young adult science-fiction. Digging deeper, it's a beautifully written series with detailed world building, twisty plots, and characters you can really stand behind. The first book is still one of my favorites. It's the moment Bobby finds out his world has disappeared, leaving him with a mission on another planet and a life that will never be the same. The atmosphere is very Hunger Games but with a much bigger scope. MacHale plays out the old good and evil battle with much more gray area than your typical young adult novel. He gives you one of the most delightfully insane villains and a hero worthy of Harry Potter all in one. Merchant of Death is a fast read that keeps you on your toes. I was never comfortable, because I knew that just when I thought I had a hang of what was happening, MacHale was going to pull out the rug. The final twist blew me away, and the cliffhanger had me clawing for the next book. Not to mention, I spent my early teen years half in love with Bobby Pendragon, who's an adorable, heroic, admirable main character with enough flaws to keep him real. The supporting cast is just as great. You get to know Bobby's best friends a lot through their interludes, so it's like having a Ron and Hermione who are just as important as Harry. I cannot overstate how magical, breathtaking, and creative this book is. I'm rarely surprised in books. Call me narcissistic, but I just have a knack for guessing what will happen. Drives my friends nuts in the theater. But MacHale surprised me. Shocked me, in fact, more than almost any young adult writer ever has. Shocked me in the way that when I got to the twist, I had a small heart attack--but as I thought more about it, all the pieces started to make sense, and I wondered how I hadn't seen it coming. That's the kind of writing you can expect here. It's fast-paced and thrilling, always something going on from the first page. But you're still given plenty of time to savor the new world he puts you in. Read this book and you'll want to be a Traveler as much as you ever wanted that Hogwarts letter on your eleventh birthday. The idea of people keeping the universe in line is insanely cool. Not overly new, but the way that MacHale writes it makes it feel fresh. Then there's Saint Dane, the baddie, a total sadistic crazy person who brings villainy to a whole new level. He's the Joker for young adult science-fiction, only much, much more terrifying. The world in Merchant is also great on its own. I've seen a lot of half-done worlds in young adults science-fiction and fantasy. MacHale doesn't settle for that. Denduron feels real--both new and familiar, like something out of The Time Machine with its own special twist. It's not even his most creative world, but you'll have to read the rest of the series to get to those. Just writing this makes me want to go read it again! Can I give it a six? I rarely come across a book where I love all the characters so much. Even the ones I hate. Bobby is the perfect Arthurian hero, but not in an annoying way. He's the guy you want to be, or date, and half of what makes him so admirable is that he's so well-adjusted. No tormented bad-boy here. He's a normal guy, confident in some ways, scared to talk to his long-time crush, devastated over what's happened to his life but also curious and gracious about the opportunity he's been given. Don't worry--he's got enough flaws that you don't have to hate him for being perfect. His Uncle Press is a fantastic mentor figure and reminds me a lot of Merry in Susan Cooper's The Dark is Rising sequence, another favorite. Then there's Mark, his nerdy best friend, and Courtney, his crush, the only two people who seem to remember that he existed. You get their perspective in alternating chapters, which means that they become as real to you as Bobby. Their perspective on his adventures adds a whole other layer. Oh, and Saint Dane. Can I say three times in one review that he's the perfect villain? The style is typical young adult science-fiction with a little more prettiness to it. MacHale makes you feel like you're on Denduron, in the mines, or swishing through the crystal flume, or watching the effects of the explosive tak. Reading this book, I felt transported to a magical world in a way that few books can do. Honestly, I'd put him right up there with J.K. Rowling and I think it's a shame that he doesn't have a bigger fan base, because he's just as clever and polished. The way the book is set up is really, amazingly clever. Basically, half the chapters are Mark and Courtney on Earth, and half are Bobby describing his adventures. Only the Bobby chapters are journals, sent via wormhole. At various times. Which means that when you're reading a Mark and Courtney chapter and they get a journal, that's already happened, and they have no idea what Bobby is doing now. Sometimes journals will come one after the other. It's such a clever structure for a story and it makes it feel even more urgent, because you are Mark and Courtney. I was just as much on the edge of my seat as they were and I had a hard time not skipping ahead. 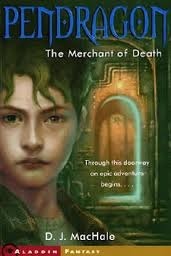 Merchant of Death is a masterful science-fiction and fantasy hybrid with an atmosphere worthy of Harry Potter and a story that will keep you nail-biting until the last page. Yay! Been wanting to read this for so long! :) Awesome review!